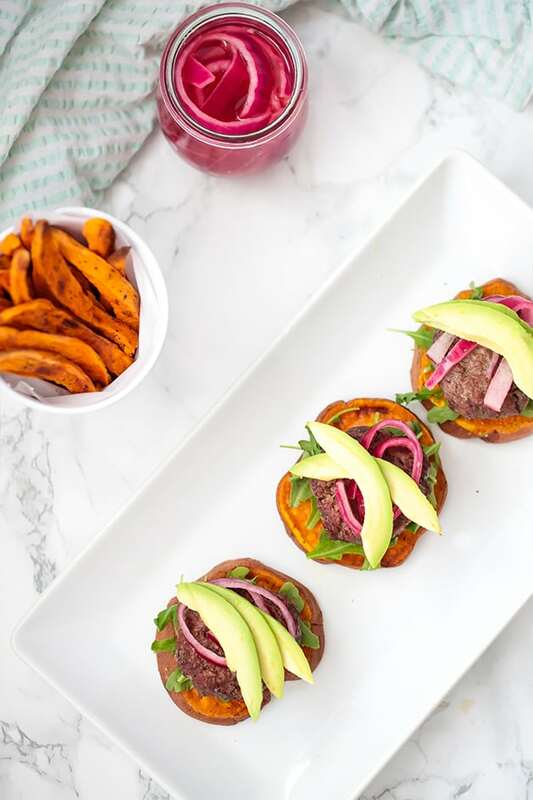 These sweet potato sliders are the perfect way to satisfy your burger cravings. They’re Paleo, Whole30, AIP, and come with some delicious toppings! We’re big burger fans in the Hoover household! We love pulling out the grill to make some juicy burgers with our own favorite toppings. However, there’s almost always a disagreement about the buns! My husband doesn’t follow a grain free lifestyle and always wants to go for cheap processed buns, while I protest and want to go bunless. These sweet potato sliders have been the perfect compromise! 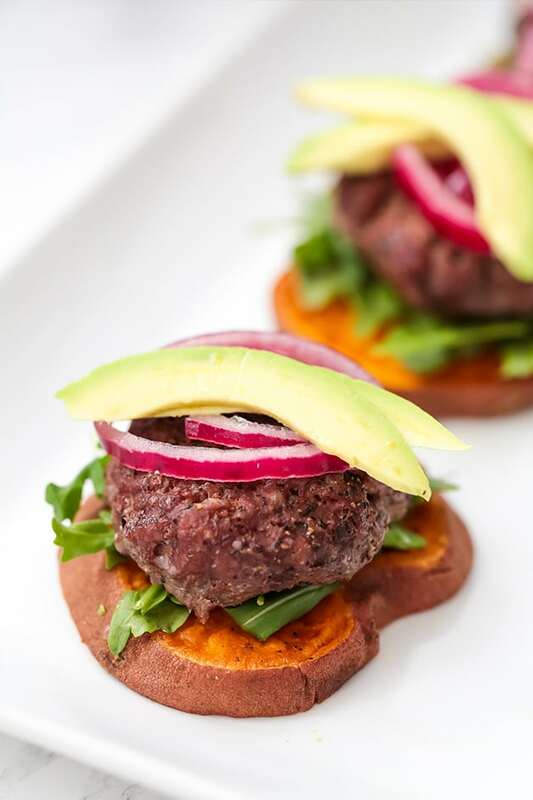 These fun sliders are totally paleo, whole30, and AIP while still having the feeling of having a soft, yummy bun! They’re easy to make, and both my husband and I totally love them. You could totally use turkey as well to make a turkey burger, but we’re going for just straight up ground beef burgers here. The amount of sweet potatoes you use will vary depending on whether or not you want two buns, or to leave it open face, or whether or not your sweet potato is large enough. You want to look for large, round sweet potatoes to make the best buns. For cooking the sweet potato buns. These are the toppings of choice as they fit well on the slider and the flavors go well together. However, can always mix it up. You’ll find the quick pickled onion recipe here. These are for seasoning the burger. Omit the pepper for AIP. Preheat the oven to 400 F and line two baking sheets with parchment paper. One sheet for the sliders, the other for the buns. Wash the sweet potato well to remove any impurities. Slice the sweet potatoes into buns about 1/4th inch thick. You want about 8 buns if you’re doing an open faced slider, or 16 if you want two buns. Evenly space the sweet potato buns on a baking sheet and coat with coconut oil and salt. Bake for 30-35 minutes or until crisped to liking. Set aside and allow to cool. 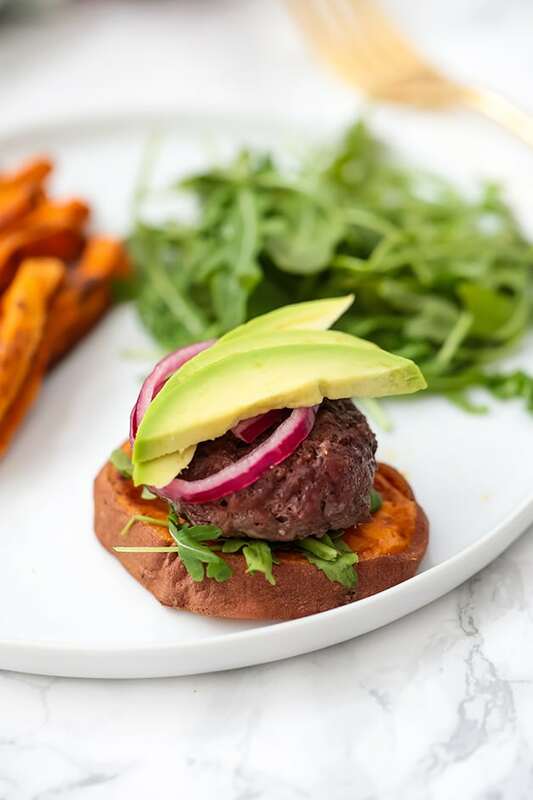 Top the sweet potato buns with arugula, burger, pickled onions and avocado. Finish with another bun, or leave open faced.